Mathematically, Mercedes Formula One driver Lewis Hamilton could clinch a third world driver’s championship this weekend. Because one of the key players in that equation will take a grid penalty for this weekend’s United States Grand Prix, Hamilton’s job just got a bit easier. Here’s why you should watch anyway. Sky Sports reports that Hamilton needs to score two points ahead of Mercedes teammate Nico Rosberg nine points ahead of Ferrari driver Sebastian Vettel to seal the deal on a 2015 championship. Unless both Mercedes cars finish ninth and tenth, Hamilton scoring more points than Rosberg will end Rosberg’s hunt for the championship. 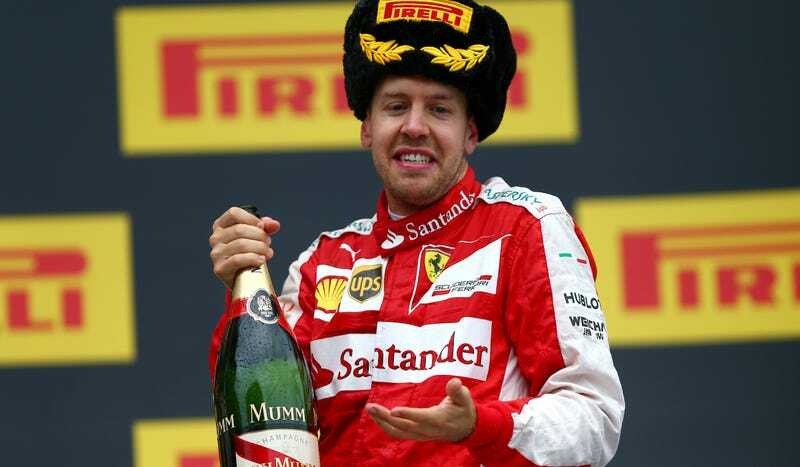 Knocking Sebastian Vettel out, however, was a more difficult proposition. If Hamilton wins, Vettel still needs to finish third or below for that win to become Hamilton’s second world driver’s championship in a row. BBC F1 reporter Andrew Benson just confirmed that Vettel will take on an additional fifth engine this weekend, which gives him an automatic ten-place grid penalty. Vettel says that this has always been planned, but at first glance, it certainly looks like inopportune timing for everyone except Lewis Hamilton and Mercedes. No matter where Vettel qualifies for the United States Grand Prix, he’ll be starting at least ten places behind that. Given the numbers, it sounds like more of the same from much of the season could happen this weekend: Mercedes qualifies well, Hamilton ends up in front of Rosberg, yaaaaawn, Hamilton wins the 2015 Formula One World Driver’s Championship. That’s neat if you’re a Hamilton fan, but not the most compelling reason to watch, I’ll admit. We’ll need to pay attention further back in the field. That’s right—don’t give up on this race just yet. Not only could we see one balls-out blaze of glory drive from Sebastian Vettel — who’s quite good at working through traffic in a short amount of time — but the forecast calls for heavy rain. Rain could certainly shake up this race in no time, and in addition to the pure chaos factor, Vettel’s an amazing driver in the wet. So, even you, Hamilton Hater Numero Uno, should still tune in. Just because Hamilton could win it all doesn’t mean he will this time, and I expect nothing short of an insane fight to postpone that championship title until after this weekend. At the very least, we should see an absolutely bonkers rush to the front out of Vettel. 66 points may separate Vettel from Hamilton, but that makes Vettel’s the closest competitor of the field, ahead of Rosberg. Vettel is a four-time world champion in his own right and won’t let this season go without a fight.